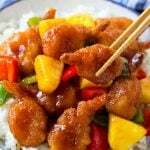 This sweet and sour shrimp recipe is made with crispy shrimp, colorful veggies and pineapple, all tossed in a homemade sweet and sour sauce. The perfect quick and easy summer dinner that’s great for entertaining! There’s nothing better than enjoying a restaurant quality meal in the comfort of your own home! Serve this sweet and sour shrimp with veggie fried rice and a side of homemade egg rolls for a dinner that’s sure to get rave reviews. I don’t know about you, but this summer I’ve been even more into making quick and easy dinners than ever before. The weather has been just beautiful here in California, and who wants to spend a ton of time in the kitchen when you could be outside enjoying summer fun? My new favorite way to get dinner on a table in a flash is this sweet and sour shrimp. It tastes like something you’d get at a restaurant, but is easy enough to make at home any day of the week. I’m always looking for new ways to incorporate seafood into my family’s diet, as the USDA recommends at least two 4-ounce servings of seafood a week. 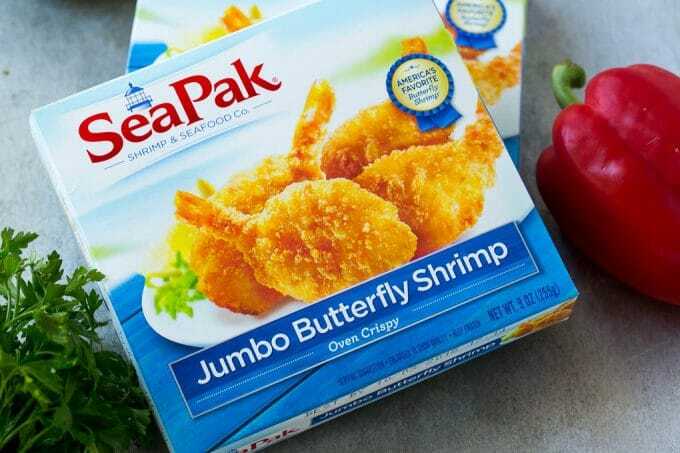 My picky eaters happen to love SeaPak Jumbo Butterfly Shrimp, which is what I often turn to when we’re trying to meet our seafood goal! 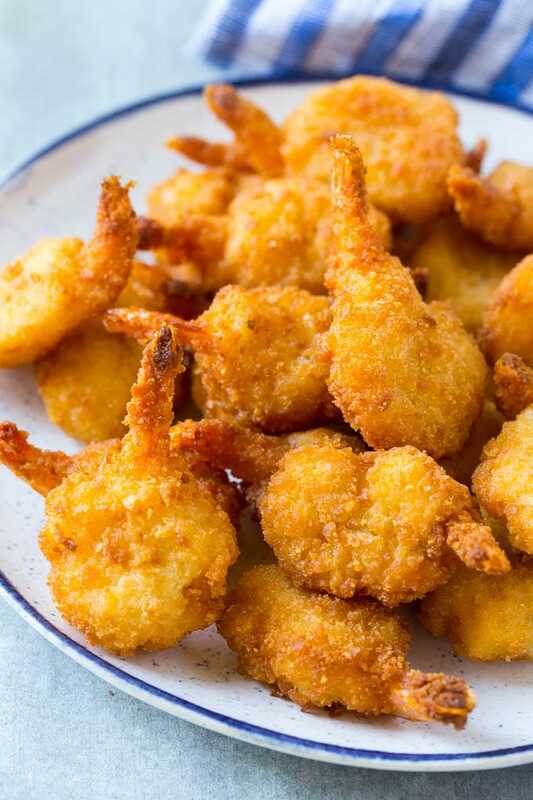 I combine these plump and crispy shrimp with summery ingredients like pineapple and bell peppers for a meal that’s perfect to enjoy outside on a bright sunny day. 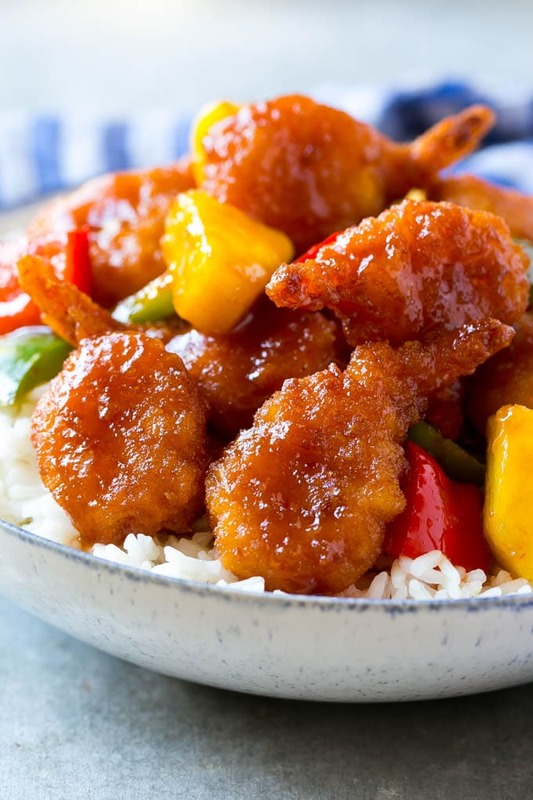 There are two steps to this sweet and sour shrimp. The first step is to prepare the shrimp and vegetables. The shrimp and peppers cook together on a sheet pan in the oven. While the shrimp are cooking, I make an easy homemade sweet and sour sauce. After the shrimp and peppers come out of the oven, they get tossed with fresh pineapple chunks and the sauce. I also like to put up a pot of rice to boil at the same time as I put the shrimp in the oven. 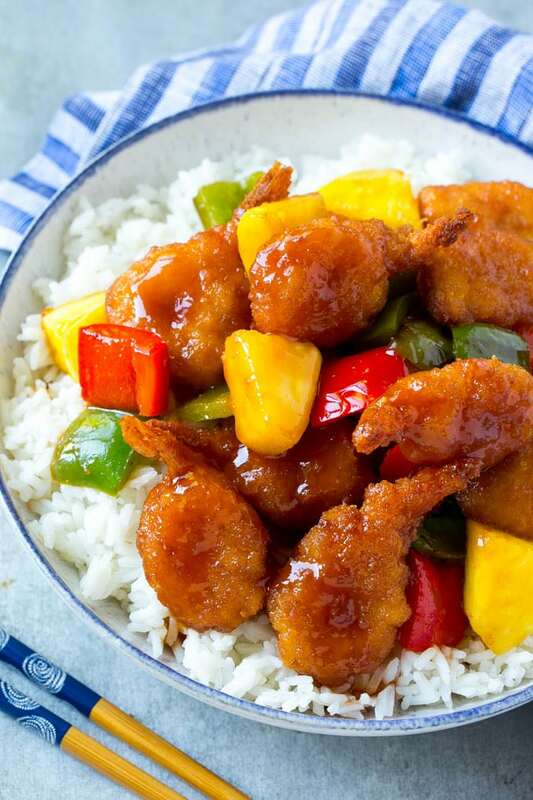 Serve the sweet and sour shrimp over the rice and enjoy! We often eat outdoors in the summer time, and one thing I do to make it enjoyable for all is to set up a buffet outside with plates, silverware, napkins, pitchers of drinks and our meal. That way people aren’t running in and out of the house constantly to get more food or refill their drinks. It’s definitely a more relaxing way to eat! 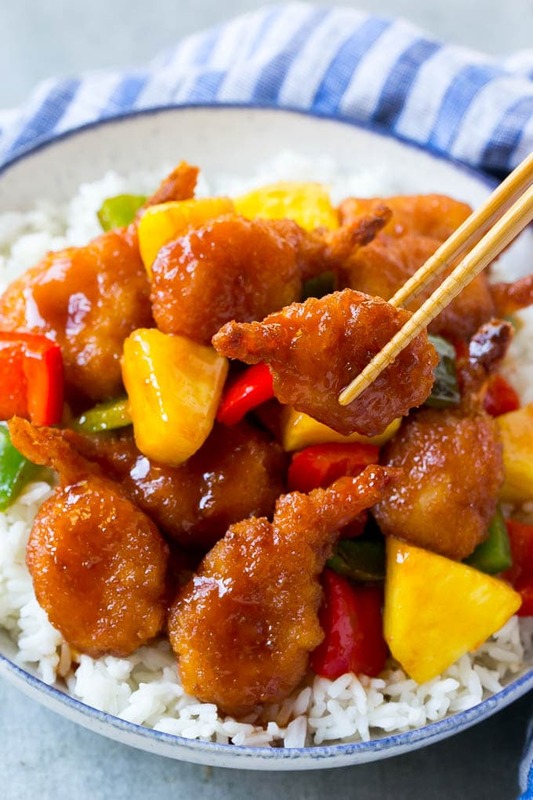 This sweet and sour shrimp recipe is made with crispy shrimp, colorful veggies and pineapple, all tossed in a homemade sweet and sour sauce. The perfect quick and easy summer dinner that's perfect for entertaining! Preheat the oven to 425 degrees. Line a sheet pan with foil and coat the foil with cooking spray. Place the shrimp on one side of the pan and the peppers on the other side of the pan. Toss the peppers with the oil and season with salt and pepper to taste. Bake for 14 minutes or until shrimp are browned and crispy and peppers are softened. While the shrimp and peppers are cooking, make the sauce. In a small pan bring the sugar, apple cider vinegar, soy sauce, garlic powder, onion powder and ketchup to a boil. Mix the cornstarch with 1 tablespoon of cold water and stir until smooth. Pour the cornstarch into the sauce and cook for 1 more minute or until sauce has thickened. Remove the shrimp and peppers from the oven; add the pineapple to the pan. Pour the sauce over the top and toss to coat. Serve immediately, over rice if desired. I made it recipe for my birthday dinner and it was a hit. So glad you enjoyed it, happy birthday! I’m a real fan of sweet and sour and this is going on my next weeks meal plan! Great looking sweet and sour shrimp entree! Looks like a real crowd pleaser!